Skin cancer is rising, but nobody’s checking. 1 in 5 people will contract skin cancer at some point and 2,500 people lose their lives to the disease every year in UK. Surprisingly, there is no NHS screening available. A mole (naevus) is a benign growth of melanocytes, cells that gives skin its color. 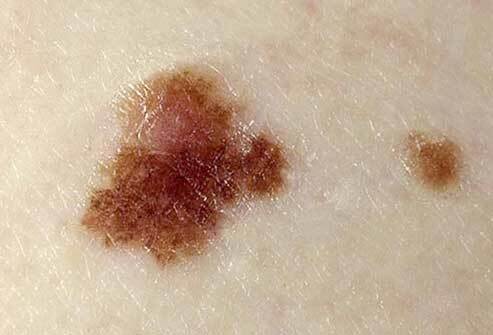 Although very few moles become cancer, abnormal or atypical moles can develop into melanoma over time. “Normal” moles can appear flat or raised or may begin flat and become raised over time. The surface is typically smooth. Moles that may have changed into skin cancer are often irregularly shaped, contain many colours, and are larger than the size of a pencil eraser. Most moles develop in youth or young adulthood. It’s unusual to acquire a new normal mole in the adult years, particularly beyond the age 45. Dr Deepak Rallan, is one of the UK’s foremost Dermoscopist and was awarded the title of International Academic Expert in Dermoscopy in 2015. Dr Rallan is a consultant at James Paget University Hospital and the founder of Diamond Skin Care. Fair-skinned, blond, or red-haired people with blue or green eyes are most at risk. These small, scaly patches are caused by too much sun, and commonly occur on the head, neck, or hands, but can be found elsewhere. They can be an early warning sign of skin cancer, but it’s hard to tell whether a particular patch will continue to change over time and become cancerous. Most do not, but doctors recommend early treatment to prevent the development of squamous cell skin cancer. 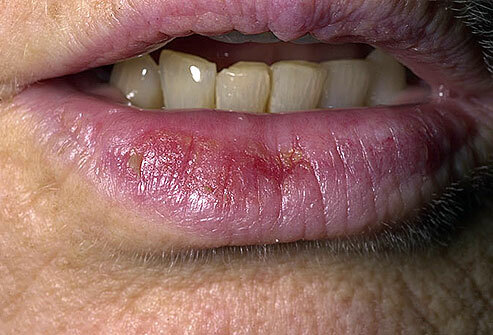 Related to actinic keratosis, actinic cheilitis is a precancerous condition that usually appears on the lower lips. Scaly patches or persistent roughness of the lips may be present. Less common symptoms include swelling of the lip, loss of the sharp border between the lip and skin, and prominent lip lines. Usually occurs in fair-skinned elderly adults with a history of significant sun exposure. The cutaneous horn appears as a funnel-shaped growth that extends from a red base on the skin. It is composed of compacted keratin (the same protein in nails). It is a specialized type of actinic keratosis. The size and shape of the growth can vary considerably, but most are a few millimetres in length. Squamous cell carcinoma can be found at the base. Typically of mixed colour, including pink, red, tan, and brown. 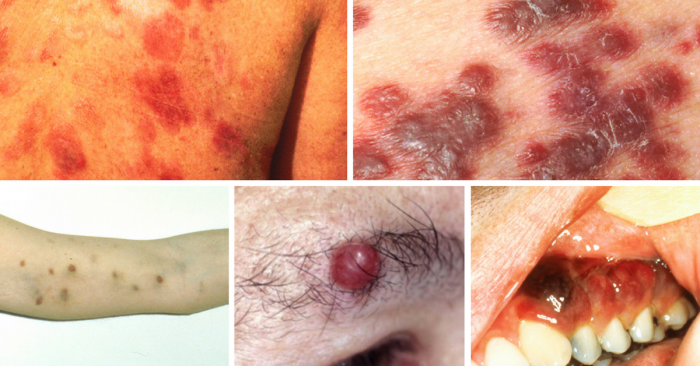 Atypical moles are not cancer, but they can look like cancer and cause undue concern. They can be found in sun-exposed or sun-protected areas of the body. Atypical moles may be larger (one-quarter inch across or larger) and more irregular in shape, with notched or fading borders. Most moles on a person’s body look similar to one another. A mole or freckle that looks different from the others or that has any characteristics of the ABCDEs of melanoma should be checked by a dermatologist. It could be cancerous. The ABCDEs are important characteristics to consider when examining your moles or other skin growths, you can learn them in the below. But beware – the ABCDE system has some major flaws which will be discussed shortly. Asymmetry means one half of a mole does not match the other half in shape and colour. When checking your moles or freckles, draw an imaginary line through the middle and compare the two halves. If they do not look the same on both sides, have it checked by a dermatologist. If the border or edges of the mole are ragged, blurred, or irregular, have it checked by a dermatologist. 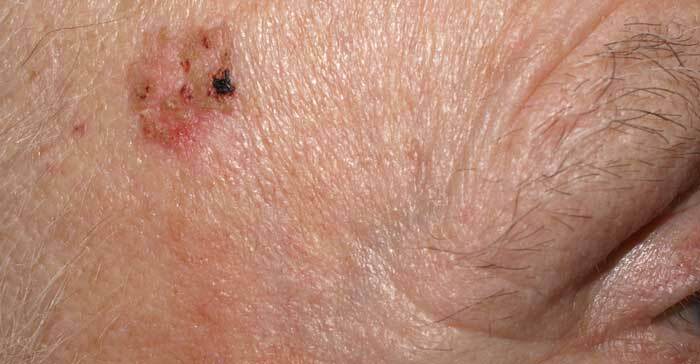 Melanoma lesions often have uneven borders. A mole that does not have the same colour throughout or that has shades of tan, brown, black, blue, white, or red is suspicious. A mole is suspicious if the diameter is larger than 6mm. A mole that is evolving – growing larger and/or changing colour – should be checked. Minor features like – begins to itch or bleed – should also be checked. If a portion of the mole appears newly elevated, or raised from the skin, have it looked at by a doctor. Melanoma lesions often grow in diameter or change in height over a 3-4 month period. The introduction of a technique called dermoscopy has enabled dermatologists to overcome 2 Major flaws of the ABCDE system. 1.) It is NOT an early detection method. It is a useful diagnostic method, but melanoma found by this method alone could be quite advanced. 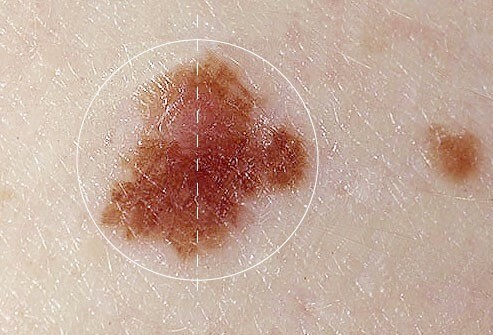 It is possible for early melanoma to be perfectly symmetrical. The visual asymmetry can take up to 6 months or more to become apparent. The same applies to border irregularity. A melanoma becomes obviously irregular when it expands beyond its own margin. However, abnormal melanocytes within the perimeter of a mole would not produce a visibly irregular border until much later. The colour black is the earliest and most definite warning sign. Most benign moles are brown to dark brown and have more than one shade of brown. 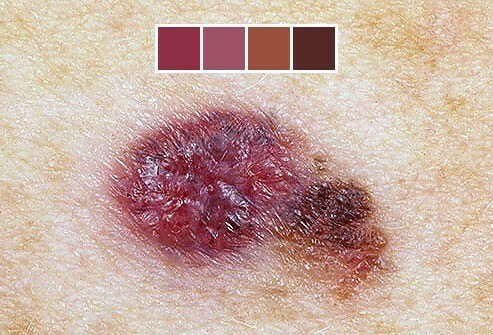 Although a diameter of 6mm is considered suspicious, it must be remembered that all melanoma starts at 1mm! The 6mm rule can leave people thinking that anything below 6mm is fine. 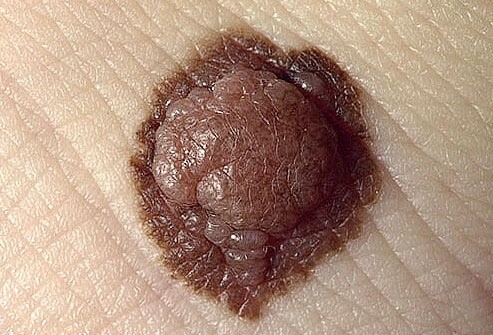 We do not advise that anyone should wait for a new, black and changing mole to grow to 6mm before having it checked. 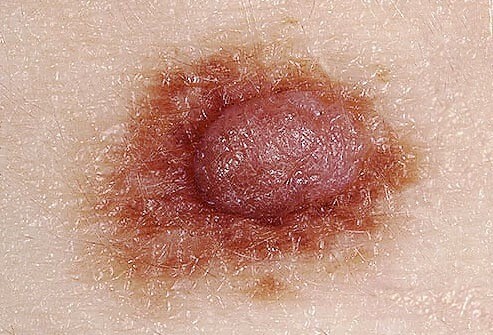 Nowadays, melanomas can be diagnosed and removed at 4mm or under, having being caught early by dermoscopic examination. ​2.) The ABCDE system can cause significant undue concern with each element. Biological nature is not perfectly smooth or symmetrical. Few moles are completely symmetrical in shape. This visual asymmetry increases as the examiner uses higher and higher magnification to assess the lesion or if a picture is taken with a zoom lens. The same applies to border assessment and colour variation. Few moles have completely smooth borders and again increasing magnification increases the visual irregularity of the borders. Most normal moles tend to have more than one shade of brown and furthermore, all benign moles do gradually evolve. They start off flat and become raised over years – this is normal. So the vast majority of ‘elevated’ moles are absolutely fine. It is also worth remembering that many people have non-cancerous moles and blemishes well in excess of 6mm. If you are a regular mole checker, you might find you are visiting your GP with the ABCDE criteria on a daily basis! There is No Peace of Mind in Anxiety. 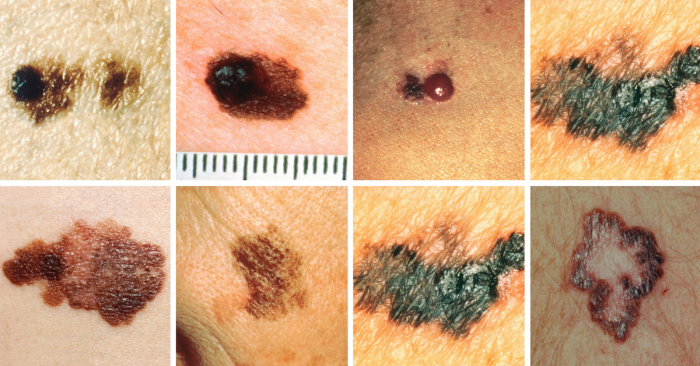 In summary, the ABCDE features are more frequently found in melanomas, but the public is not informed that these features are not infrequently also found in normal moles. The ABCDE system was developed well before dermoscopy as a way of helping GPs and the general public to diagnose established melanoma. Dermoscopy was invented in the late 90s with the intention of screening and early detection, well before any surface signs are obvious. Examine your skin on a regular basis. A common location for melanoma in men is on the back, and in women, the lower leg. However check your entire body for moles or suspicious spots once a month. Start at your head and work your way down. Check the “hidden” areas: between fingers and toes, the groin, soles of the feet, the backs of the knees. Check your scalp and neck for moles. Use a handheld mirror or ask a family member to help you look at these areas. Be especially suspicious of a new mole. Take a photo of moles and date it to help you monitor them for size and shape change. It is normal for moles on your body to undergo changes if you’re a teen, pregnant, or going through menopause, times when your hormones may be surging. If you find a mole or spot that has any ABCDE’s of melanoma — or one that’s tender, itching, oozing, scaly, doesn’t heal or has redness or swelling beyond the mole — see a doctor. Your dermatologist may want to remove the mole and biopsy it. If suspicious of cancer, the entire mole and a rim of normal skin around it will be removed and the wound stitched closed. Additional treatment may be needed. 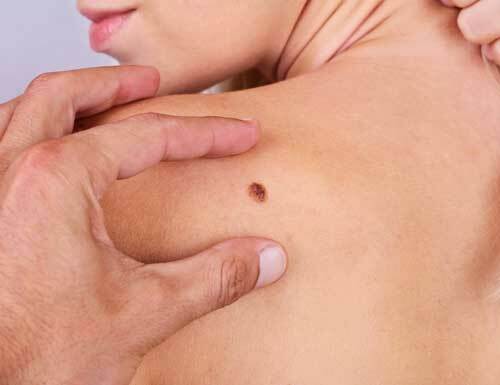 Malignant melanoma, especially in the later stages, is serious and treatment is difficult. Early diagnosis and treatment can increase the survival rate. Non-melanoma skin cancers include basal cell carcinoma and squamous cell carcinoma. Both are common and are almost always cured when found early and treated. People who’ve had skin cancer once are at risk for getting it again; they should get a checkup at least once a year. Melanoma is not as common as other types of skin cancer, but it’s the most serious and potentially deadly. 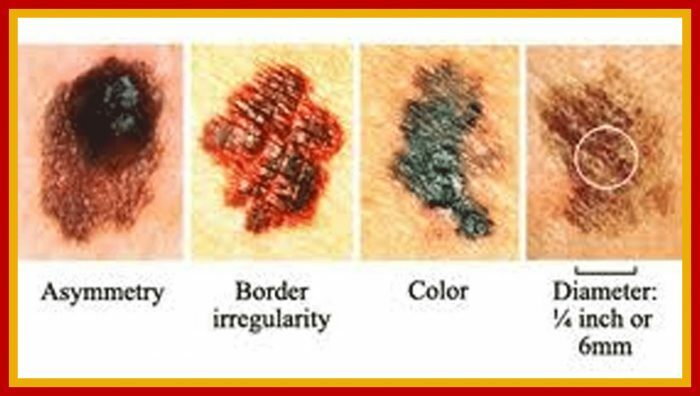 Possible signs of melanoma include a change in the appearance of a mole or pigmented area. Consult a doctor if a mole changes in size, shape, or colour, has irregular edges, is more than one colour, is asymmetrical, or itches, oozes, or bleeds. 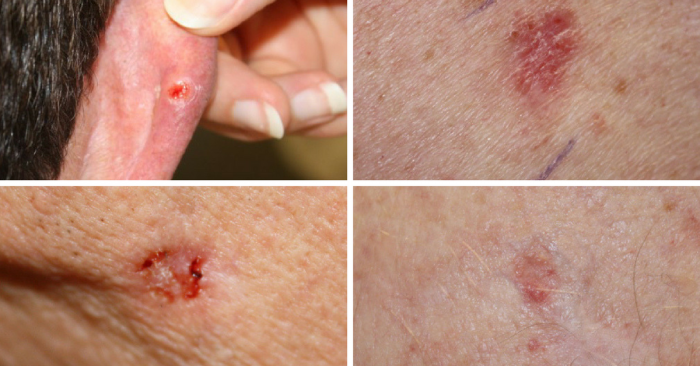 This non-melanoma skin cancer may appear as a firm red nodule, a scaly growth that bleeds or develops a crust, or a sore that doesn’t heal. It most often occurs on the nose, forehead, ears, lower lip, hands, and other sun-exposed areas of the body. Squamous cell carcinoma is curable if caught and treated early. If the skin cancer becomes more advanced, treatment will depend on the stage of cancer. 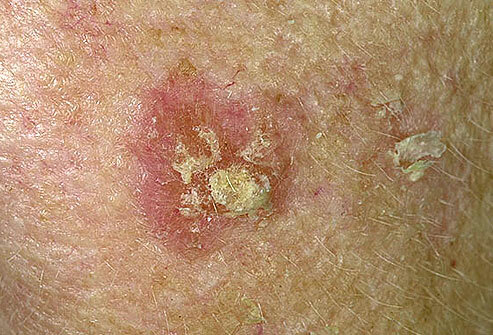 It is a type of pre-cancerous sun damage that spreads outward on the surface of the skin. By contrast, “invasive” squamous cell carcinomas can grow inward and spread to the interior of the body. Bowen disease looks like scaly, reddish patches that may be crusted; it may be mistaken for rashes, eczema, fungus, or psoriasis. Basal cell carcinoma is the most common and easiest-to-treat skin cancer. Because basal cell carcinoma spreads slowly, it occurs mostly in adults. Basal cell tumours can take on many forms, including a pearly white or waxy bump, often with visible blood vessels, on the ears, neck, or face. Tumours can also appear as a flat, scaly, flesh-colored or brown patch on the back or chest, or more rarely, a white, waxy scar. 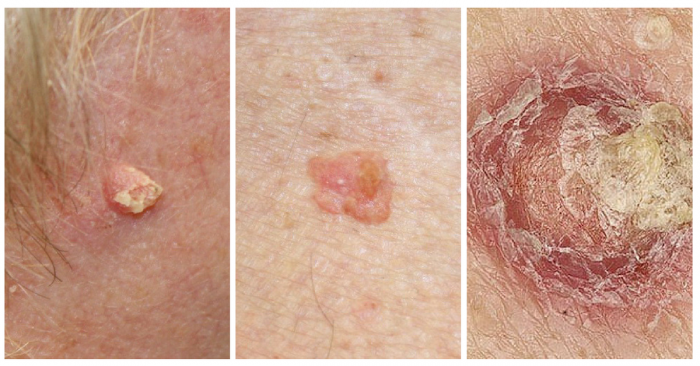 Uncommon types of skin cancer include Kaposi’s sarcoma, mainly seen in people with weakened immune systems; sebaceous gland carcinoma, an aggressive cancer originating in the oil glands in the skin; and Merkel cell carcinoma, which is usually found on sun-exposed areas on the head, neck, arms, and legs but often spreads to other parts of the body. Sun exposure is the biggest cause of skin cancer. But it doesn’t explain skin cancers that develop on skin not ordinarily exposed to sunlight. Lived at high altitudes or with year-round sunshine. Limit your exposure to the sun’s ultraviolet rays, especially between 12 p.m. and 4 p.m., when the sun’s rays are strongest. While outdoors, liberally apply a broad spectrum sunscreen with an SPF of 30 or higher (don’t forget the lips and ears! ), wear a hat and sunglasses, and cover up with clothing. And remember, if you notice changes to your skin such as a new growth, a mole changing appearance, or a sore that won’t heal, see a doctor right way.